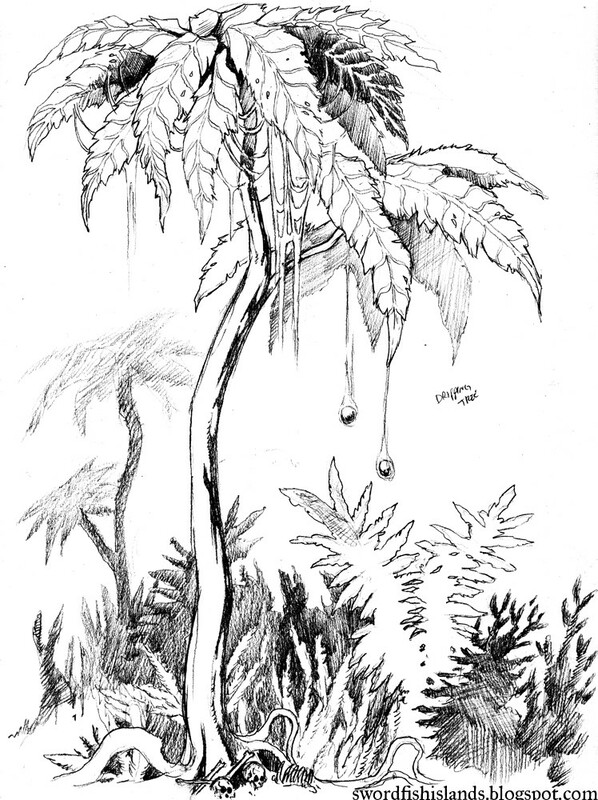 The Dripping Tree has dark brown bark, large leathery leaves, and grows as tall as 30'. Its branches only grow from the very top of the trunk and spread out almost horizontally, much like the cap of a mushroom, to shade an area 10' to 20' in diameter. The roots of a Dripping Tree spread and twist through the ground almost as far as the branches above and are almost always covered in thick mats of other vegetation like Ferns, Tickleweed, and Jellymoss. Numerous cream colored spheres, 10" in diameter, cling to the branches are the source of the tree's name. Special nodules on the roots of this tree detect movement, warmth and pressure causing the globes directly above the triggered area to fall. The globes are filled with a viscous, sticky mucus and burst on contact, causing creatures hit with them to stick to the Dripping Tree's root clusters. When pressure is constantly applied to an area of roots, the branches above it begin to slowly drip a sticky, acidic, digestive mucus onto the area below. This mucus melts through flesh and bones like butter. Smaller creatures, such as lemurs and tabibari can be dissolved in as little as a day, while larger creatures and humanoids may take up to 72 hours to be broken down into nutrients.